4 Beds 2 / 0 Baths 1,932 Sq. ft. 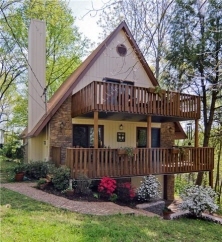 Description: Immaculate, beautifully remodeled 1978 a-frame on .55 acre wooded lot. 4 decks with lots of privacy, 1100 sq ft unfnshed basement/tandem 2 car garage, newly painted exterior. Many updates, 1 yr home warranty. Come see this awesome property!